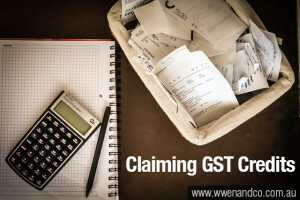 GST Credits For Employee Reimbursements – Can You Claim Them? Who is eligible to claim GST credits for employee reimbursements? Are you eligible to claim GST credits on employee reimbursements? Your employee is not directly entitled to a GST credit for the expense. The Tax Office says a business can claim GST credits where it has relevant documents such as receipts or tax invoices issued to the employee. These will need to be provided to substantiate claims for reimbursement. A business that is entitled to a GST credit can claim it in a Business Activity Statement once it has been provided with this documentation. An “expense payment benefit” is made, according to the Tax Office, when a business makes a payment to, or reimburses, another person “in whole or in part, of an amount of money spent by your employee as part of their employment with you”. Please Note: Fringe Benefits Tax (FBT) may apply! Paid the employee an “allowance” . The Tax Office says that if a business makes a payment to an employee based on a “notional” rather than an actual expense, it is not making a reimbursement. For example, if a business makes a cents-per-kilometre payment to cover work-related use of an employee’s private car, it is paying an allowance and not making a reimbursement (again, you will want to consider the FBT implications). A business makes a reimbursement where it pays an employee for the price, or part of the price, of a particular purchase they made. For example, if an employee incurs an expense of $220 for a purchase, and is re-paid the whole $220 or even half of that, either payment will be a reimbursement. It pays an expense on behalf of the employee, for example, to the business who has made a sale to the employee (the GST legislation treats this type of payment as a reimbursement). Where any personal use of a purchased item is involved, or the expense relates to non-cash employee benefits, liability for FBT should be a consideration. Ask the accountants at the Epping office of W. Wen & Co for more guidance on FBT and GST credits for staff reimbursements.